Thomas Doctor has studied Buddhist philosophy at Ka-Nying Shedrub Ling Monastery since the late 1980s. 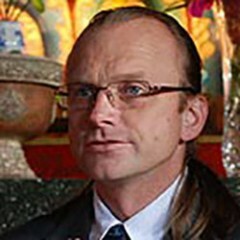 He received his MA degree in Tibetan Studies from the University of Copenhagen, Denmark, and has finished a doctoral thesis on Madhyamaka at the University of Lausanne, Switzerland. Thomas has translated several books on Buddhist philosophy, including Speech of Delight and The Ornament of Reason. He has worked as a translator and teacher for many years at the Rangjung Yeshe Institute, Kathmandu, Nepal. He studies under the guidance of Tulku Chokyi Nyima Rinpoche.